Last Tuesday, the whole school went on a field trip to the National Park. The Paka o Amerika Samoa encompasses nearly the whole island of Ta’u (technically, it includes the village of Faleasao, where I live and teach). The NPS guys who flew in from other islands were great though and the kids really enjoyed the short hike into the rain forest and learning about their island. Some people live here all of their lives and never visit the National Park proper, even though it’s only about 7 miles away from the two main villages. In fact, it was a first-time visit for one of our teachers who has taught at the school for 25 years! The little kids (kindergarten through 2nd grade) were deemed too small to hike, and instead had to ride in the back of the police truck for the less than 1/4 mile hike. Most of the kids were okay with that, but my boys were supremely bummed out about it. While we didn’t get to visit the sacred site of Saua, traditionally believed to be the birthplace of mankind, we did see some interesting things along the way. It was a great opportunity for my class to review what we know about rain forests, plants, spiders and insects, and ancient Samoa all in one day! The trip was really fun, but my skin was crawling constantly. Every time I looked down I saw spiders everywhere–on my shirt, my arms, my pants, my shoes, my backpack, everywhere. It was terrible. The next day one of my students wrote in her journal that she saw a big spider on my headband but didn’t tell me because she knows I’m scared of spiders. Thanks a lot! We also had a school-wide clean-up day on Friday. It was hosted by the Science committee, which I am on with three other teachers. The older kids cleaned up the beach in front of our school, and levels K5-4 cleaned the campus. After the clean-up, we had an assembly to finish off the Science committee’s activities for the month. I can’t explain exactly what this assembly had to do with Science, so if you can make a connection for me, feel free to share! (I’m on the committee, sure, but I had no say in this.) The school was separated into four groups and each group was assigned a musical. Originally, I was super excited about performing songs from Grease with my group, but then I read the lyrics. Do you guys remember there being cusses in that movie?! I guess being around little kids for 6.5 hours every day helps you to see just how kid un-friendly everything in the world is. So I tried to change our musical to something a little more fit for elementary school–The Lion King, Beauty and the Beast, even Joseph King of Dreams–but was completely unsuccessful. I think the only thing I really accomplished was making a name for myself as the Prudiest Prude in the village. The alternative? Grease was dropped, but then my group was assigned the wholesome youth-favorite Mama Mia. All in all it turned out alright but I really hope to never again hear a 6 year old singing about being in the mood for love. The kids had a good time though and worked really hard on their solos and choreography. Anyway, you can see videos of my group performing here and here. 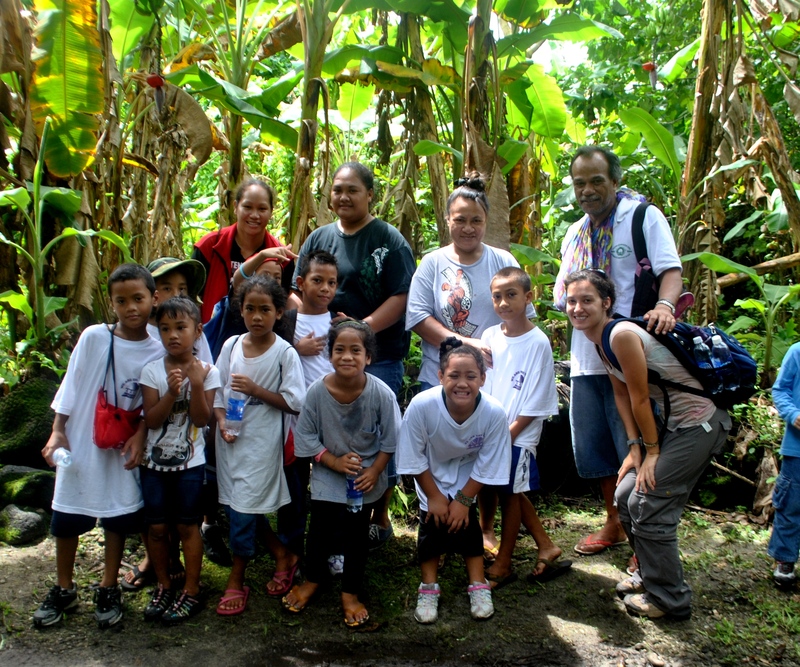 This entry was posted in American Samoa and tagged field trip, jungle, manu'a, national park, Paka O Amerika Samoa, photos, rainforest, science, South Pacific, spiders, ta'u, teaching, volunteering. Bookmark the permalink. Enjoy more here including the hike to Laufuti. oh gosh the kids are so cute in those videos – i can say they are cute because i have no idea what the words to that mama mia song are. there is one little boy in particular (front row, red shirt) that i just want to gobble up.